We're celebrating 20 years of being your go-to local quilt shop! This Friday and Saturday, Nov. 11-12, everything in the shop is 20% off! Barefooters get 25% off! Fabrics, books, patterns, rulers, thread-everything in the shop is 20% off! You could win this 20th Birthday Basket of goodies! Add your name to the Birthday Basket drawing every time you visit the shop! The drawing will be held Sat., Nov. 12, at 1:00 pm, followed by birthday cake for everyone! As a bonus, the first 20 people through the door on Sat., Nov. 12, receive a coupon for 25% off one item on their next visit. Door opens at 10:00 am. Have you joined the Neighborhood? The blueprint for house Block 10 is now available! Blueprints for houses 1 through 9 are available on our website through December 24. Just a reminder that the deadline for Christmas delivery is past. Bryan and Kay will no longer guarantee quilts for Christmas delivery. 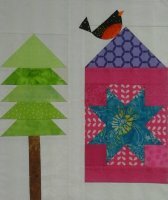 Quilt Patch will be closed Wednesday and Thursday, Nov. 23-24, for Thanksgiving. But we will be open on Friday, Nov. 25, so stop by and say hello while you're out shopping on Black Friday-we may have a flash sale of our own! One More Class In 2016! Learn the basics of hand applique on wool felt and discover the relaxing qualities of handwork while making these charming Christmas Tree ornaments. The set of three ornaments makes an incredibly thoughtful gift. Or divvy them up and decorate your gifts in style-but don't forget to save one for your Christmas Tree! 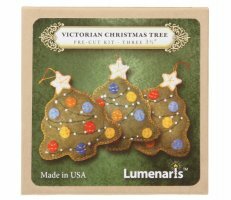 The $45 class fee includes a complete, pre-cut kit to make 3 tree ornaments. Please sign up by Nov. 14, as the kits must be special-ordered. Call us at 704-821-7554 to sign up.